"Japan is a key market for robotics," said Mario Tremblay, RobotShop CEO. "This sector is a priority for the Japanese government and several Japanese companies. Therefore we have now, not only a logistics base to better serve our customers in Asia, but also a base for surveillance and innovation to better follow market developments in that part of the world." "Here in Japan, we have already entered the era where robotics is no longer solely mechanical slaves for the industry, but servants of all," says Yves Lacroix, Director of RobotShop Japan. "Robots no longer wait for our orders but judge how best to serve us, and are part of our daily lives. With this theme, RobotShop Japan stands out and creates an important link with the rest of the innovative world of robotics. 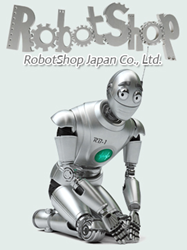 Japanese novelty will now be powered by RobotShop!"